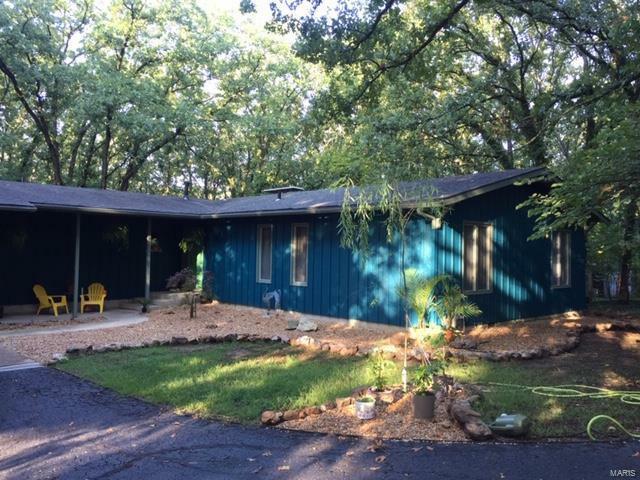 PRIVACY ABOUNDS IN THIS SPRAWLING RANCH WITH SO MUCH NEW AND UPDATED-- YET RIGHT AT EDGE OF ROLLA. NESTLED ON 5 LOTS FOR A TOTAL OF 2.42 AC, THIS ONE LEVEL LIVING ALSO HAS A NEAT LOWER LEVEL THAT OFFERS A NICE REC ROOM/OFFICE AND 4TH BEDROOM. FROM THERE YOU CAN WALK OUT TO THE LOVELY WOODED LOT AND TEND TO THE GREEN HOUSE OR USE THE WORKSHOP FOR SOME OF THOSE PROJECTS YOU WANTED TO DO. INSIDE THE HOUSE OWNERS HAVE DONE AMAZING THINGS-- HOUSE HAS TOTALLY BEEN PAINTED INSIDE AND OUT! KITCHEN HAS NEW VINYL FLOORING, RESURFACED COUNTER TOPS, NEW SINK, BACKSPLASH, BOSCH DISHWASHER, NEW FRIDGE, BEAUTIFUL LIGHTING AND MUCH MORE!THE BATHS HAVE RESURFACED COUNTER TOPS, NEW FIXTURES, DECOR AND VINYL FLOORING. LOWER LEVEL HAS BEEN PAINTED, NEW VINYL AND LIGHTING. ATTACHED GARAGE FOR STORAGE AND PROJECTS AND BACK DECK HAS A BEAUTIFUL VIEW OF THE WOODED BACK YARD. THIS HOME WAS BUILT IN THE MID 60'S AND THE OWNERS HAVE TRIED TO KEEP THE CHARACTER OF THE ERA WHILE DOING THE UPDATES TO THE HOME.